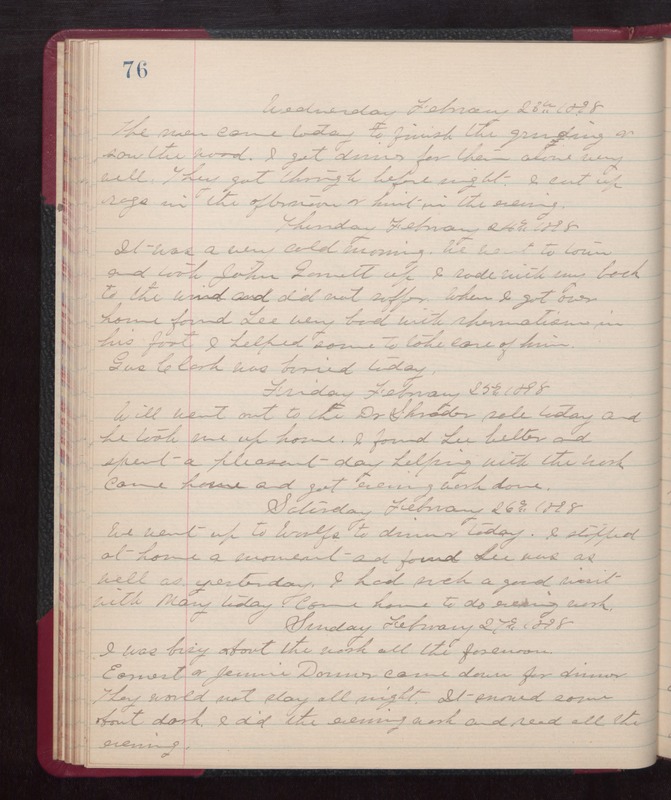 Wednesday February 23rd 1898 The men came today to finish the grinding & saw the wood. I got dinner for them alone very well. They got through before night. I cut up rags in the afternoon & knit in the evening. Thursday February 24th 1898 It was a very cold morning. We went to town and took John Garnett up. I rode with my back to the wind and did not suffer. When I got over home found Lee very bad with rheumatism in his foot. I helped some to take care of him. Gus Clark was buried today. Friday February 25th 1898 Will went out to the Dr Shrader sale today and he took me up home. I found Lee better and spent a pleasant day helping with the work. came home and got evening work done. Saturday February 26th 1898 We went up to Woolfs to dinner today. I stopped at home a moment and found Lee was as well as yesterday. I had such a good visit with Mary today. came home to do evening work. Sunday February 27th 1898 I was busy about the work all the forenoon. Earnest & Jennie Donner came down for dinner. They would not stay all night. It snowed some about dark. I did the evening work and read all the evening.